← A TABLE FOR TWO, WITH DINNER PREPARED BY YOU. HAPPY VALENTINE’S DAY! 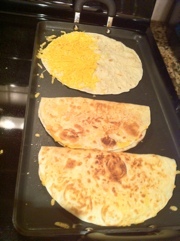 I just made quesadillas the other night. It was a simple version, I bought Perdue already cooked chicken breasts, Rotel diced tomatoes with green chiles(gives a little kick) and Wegman’s taco cheese. It was not a fan favorite for the kids but I enjoyed. 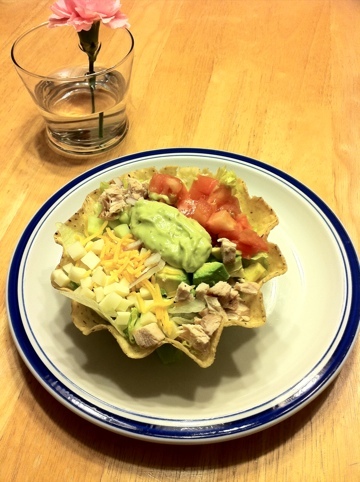 The turkey cobb salad looks delish! Hey CCM, thanks for the comment love! I find that with kids they love quesadillas but other than an occasional tomato, they prefer it with cheese only. So when I make mine I usually do just cheese for the kids & I will do what you did and add other stuff for the grown ups. 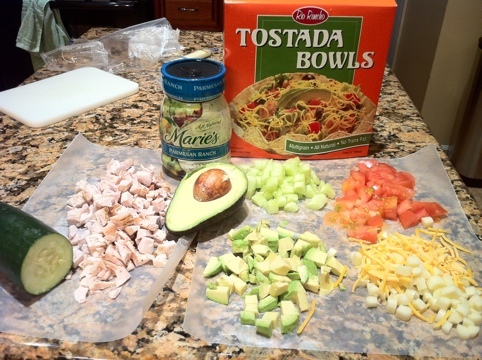 Great idea using the taco cheese as it already has the seasoning in it. This sounds great Priscilla! Where do you buy your turkey meat? I was surprised to learn when I went to Acme yesterday that they do not sell turkey pieces, only whole turkeys. Hey Lisa, thanks so much for checking out my blog. I really appreciate the support. 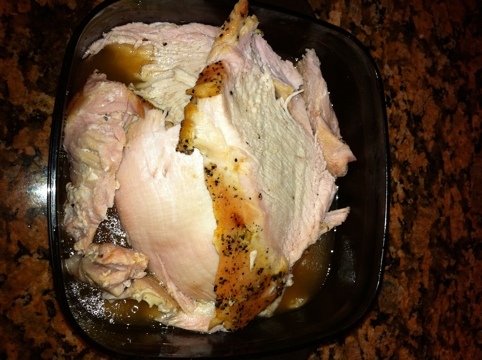 Ok, when it comes to turkey breast my absolute favorite is Wegmans Honey Brined Turkey Breast. 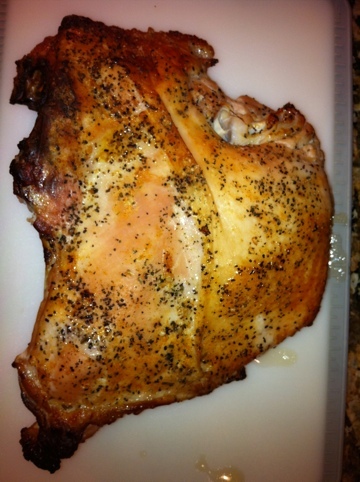 It is so flavorful and juicy, because they have already brined it. I never have to marinate it. I simply season it and can use it for several days for dinner, leftovers, lunches and quick snacks. I try to keep these in the freezer because since they are vacuum sealed, they defros easily by simply covering with water. This is definitely a staple in my house. Great post! I actually do write all of our planned dinners for the week on the calendar. Makes it so much easier. I will have to try the turkey breast. Looks yummy! Thanks Randi. Definitely try the honey brined turkey breast. It is so good and easy to make. Looks great! I made a turkey breast the other night for a recipe and everyone loved it. I too blogged about the topic of childhood obesity as it has recently been in the news. I really feel for all of the working parents that do have it so rough! I hope your blog encourages working parents to be intentional about every aspect of their limited time with their children, including what they put on the table. Blessings! Jenny, thank you so much for your comment. Yes, it can be tough. I find that for me the best thing is to try to plan things out as that makes it easier to juggle my time. Love the post! The pics look delicious, I will have to try this. I hope you will as everything has been tried, tasted and approved. LOL. It’s weird how studies are showing kids being obese, when all the kids in my family seem to be turning into little vegetarians, lol! Every time I go home, these kids will eat all the veggies off a sandwich or all the fruit before even touching meat. I was hoping that was the case with all kids, but I guess I was wrong…nice job putting up simple recipes for folks…another way to get the tomatoes pass the kids is to use a food processor and process it down to a spread, that way it’s not so chunky! I just started using whole tomatoes instead of tomatoe sauce, and by processing it, my spaghetti sauces taste waaay better! 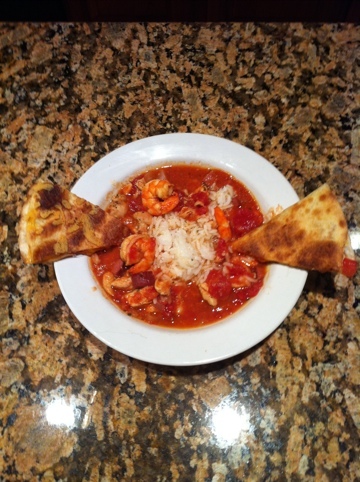 Yes, fresh tomatoes are so yummy in sauce. I especially love using them in the summer when I can grow them outside in my garden. As for the kids. Girl, yes it is getting bad. Our children are becoming more susceptible to some of the adult diseases. Especially, juvenile diabetes and even high cholesterol. Not to mention just developing the bad habits of eating fast food. So glad your family eats healthy. I would bet it is because many people in your family are good cooks. Thanks for writing this! I found you on Momsbloggerclub! I hate to meal plan but I find that it saves me time and a ton of $$. I started a blog hop to help me get more ideas. It also helps me to make healthy choices for my kids ahead of time. Like you said when we fail to plan, we plan to fail… It’s so EASY to go through the drive thru, but when I plan a healthy meal ahead of time, I find myself not doing that. I also just got into once a month cooking which saves me even more. Do you do guest posts?? I’d love to have you do a healthy recipe on my site if you’re interested. Hi Annett, thanks for checking out my site. I just started blogging and at this point I am certainly not opposed to doing guest posts. I actually consider it a great compliment. However, I just need to work it into my crazy schedule. Please send me a note on MBC with any information and I will be happy to review and consider. Thanks for the link. Your recipes look so good. Think I’m going to try the Turkey Cobb salad. I LOVE food! Nice job! Nice article, sis! Entertaining, informative, and very well-written. It’s so funny that when I read it I so hear your voice in my head!!! Lol, I write as if I plan to read this aloud. So even in reading it you can probably imagine my changes in inflection and changes in my pitch. Glad you liked the article. I *love* Michel Martin and Tell Me More. You can learn ALL KINDS of things on that show. I love Tell Me More. I will literally schedule my work so that I can listen to it. Or I will catch missed shows via their podcast. So I’m late to the party! Just found your blog, great recipe ideas on here. We are just now going through a time of cutting out fast food, sugar, processed foods…it’s hard, and I DON’T work outside the home. Can’t imagine if I did! One thing I did want to address…you’ve mentioned juvenile diabetes a few times in relation to childhood obesity and nutrition. Type 1 Diabetes, or Juvenile Diabetes as it’s often referred to, has NOTHING to do with obesity or nutrition. It’s Type 2 Diabetes that is considered an adult disease that kids are now getting, and is related to food and lifestyle choices. Type 1 is when the pancreas stops working; it’s something kids are born with and cannot be caused; and one of it’s main symptoms prior to dx is severe and quick weight loss (not gain). Type 2 Diabetes is a condition where your pancreas actually DOES work but your cells don’t process the insulin correctly, mostly because they’ve been overloaded or damaged from poor lifestyle choices. There’s a lot more I could say about these two diseases, but that’s the gist of it. Please don’t take this as confrontational or out of anger. It’s not meant that way at all. I just see so many misconceptions about the two types of diabetes and I try to educate where I can. A very close friend of mine almost lost her daughter a year ago due to Type 1 and I have learned SO much since then, and have seen her frustration as she deals with the misconceptions and assumptions people make about the diseases. Anyway, please keep blogging! I enjoyed reading through it a lot! No offense taken and thanks for reading the post and providing the correction. Also, well wishes to your friends daughter. I hope she continues to get better.